Let's be honest for a moment, shall we? We've all wanted to punch Tony Stark in the face from time to time. All the good Iron Man does makes up for the smarmy attitude and sarcastic tone, but only just. Stark, played by Robert Downey Jr., is an idealist with unwavering beliefs, kind of like the other head of The Avengers, Captain America. It was only a matter of time before these two butted heads, and it's here where Captain America: Civil War, the latest movie in the Marvel Cinematic Universe, picks its own punches. The 13th movie in the MCU has no issues when it comes to entertainment. Marvel's Kevin Feige and the people behind these films perfected the formula long ago, and Civil War is their first, real chance at shaking up the dynamic of the team. Nothing goes to waste in the process, and Civil War handily earns its stripes as more than just another superhero movie. The beliefs causing all the sparring and destruction are regarding the Avengers team, too. Acting as a private security force, The Avengers have taken care of some of the world's most dangerous threats, but the wreckage and lives lost in the process must be accounted for in the eyes of the public. The team fought back against an alien invasion in New York, but devastation left behind was cataclysmic. They stopped Ultron from destroying the human race, but the death toll to the country of Sakovia was unacceptable. 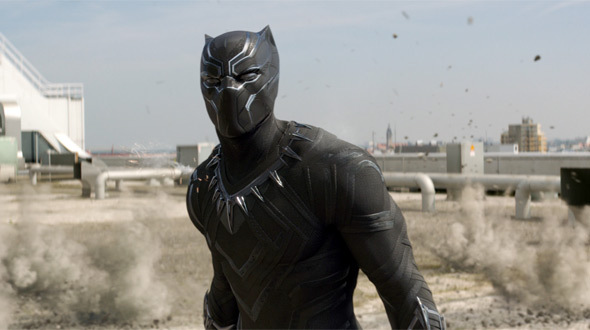 In the early moments of Civil War Captain America/Steve Rogers (Chris Evans) and his small team of S.H.I.E.L.D agents, including Black Widow (Scarlett Johansson), Falcon (Anthony Mackie), and Scarlet Witch (Elizabeth Olsen), stop a group of terrorists in Nigeria, but the resulting collateral damage is too much to be ignored and it becomes the final straw. The United Nations decides on the "Sakovia Accords", a bill that, if passed, would create a controlling, governmental body to oversee and dictate the actions of The Avengers. Naturally, Stark, still trying to make amends for the weapons his company has built as well as his personal responsibility for creating Ultron, agrees with the bill. Steve Rogers, still holding a sense of faith in humanity – as well as his own actions – feels more control is the last thing The Avengers need. It doesn't help that his best friend, Bucky (Sebastian Stan), now the brainwashed assassin known as The Winter Soldier, is still on the loose. The difference in ideals between Stark and Rogers quickly escalates. The US Secretary of State, "Thunderbolt" Ross (William Hurt), forces the members of The Avengers to either fall in line with the proposed bill or be considered criminals themselves. Rogers goes rogue, Stark fashions his own team of superheroes to pursue Captain America, and, then, things really start to blow up. Filmmaker siblings Anthony and Joe Russo proved they had the vision for Marvel's cinematic world when they added the best entry to the brand in 2014, Captain America: The Winter Soldier. Granted, of the 13 movies that make up the MCU, about half of them have achieved the title "Best of the Series" from critics and fans alike. What shouldn't be debated, though, is the skill the Russo Brothers bring to the Marvel game. Their return for Civil War was as unsurprising as it was exciting, and the pair do a fine service to the MCU as a whole. The action isn't quite nonstop. The story from screenwriters Christopher Markus and Stephen McFeely, both veterans of the Captain America saga, is given an ample amount of room to breathe, especially in the first act. The screenplay plants seeds in many characters that probably won't come to fruit for another four or five movies, but the immediate results of these seeds still adds depth and a heavy helping of emotion to the story at hand. Oftentimes in comic book movies the threat isn't quite as real, since you know the superhero is going to walk away. Civil War shows us it's only when these superheroes begin fighting one another that we truly have a vested interest in the outcome. Markus and McFeely do a terrific job in keeping their screenplay in the gray area as far as morality goes. Daniel Brühl plays the film's ultimate villain, Helmut Zemo, but his intentions and conduct mostly only serves as a catalyst. The eponymous war progresses well throughout the film's 146 minutes, and at no time do Markus and McFeely allow their screenplay to pick a side. Naturally, over the course of Marvel's cinematic run, we've become privy to the motivations behind every action Stark and Rogers have made. The screenwriters behind Civil War keep those motivations in line with their characters and their respective histories. The ensuing battle of ideologies brings with it layer upon layer of character development, and we, as fans, fully understand – and empathize with – both sides of the war. The Russo Brothers not only return with their distinct style of action to visualize that ensuing war, they come back with a sense of humor that puts even Joss Whedon to shame. Every character has a moment of levity, even the ones you may not expect. Once the incredible series of battles begins, the Russos unleash their full-on assault of either massively intense, action pieces or tremendously charged scenes of drama peppered with flat-out hilarious lines. Let's be honest, the humor bullets fly fast and true in the action sequences as well. 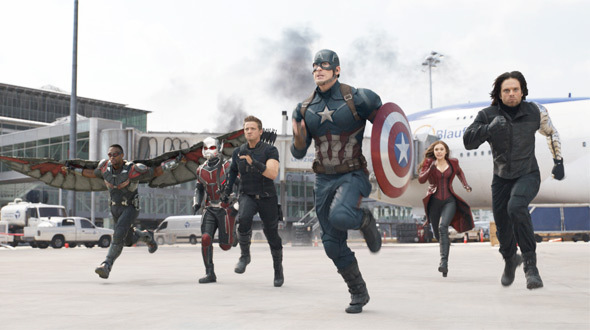 The ultimate battle on an abandoned airport runway at the end puts all of the superheroes in the movie on the battlefield at once, Rogers and his team of Falcon, the Winter Soldier, Scarlet Witch, the rogue, S.H.I.E.L.D. agent, Hawkeye (Jeremy Renner returning), plus Ant-Man (Paul Rudd returning) on one side; Stark and his squad of Black Widow, The Vision, War Machine (Don Cheadle returning), plus introducing newcomers Black Panther (Chadwick Boseman) and a little-known comic book character, Spider-Man (Tom Holland), on the other side. Needless to say, it's an all-out assault of blockbuster action but one that delivers a shocking amount of both surprises and comedic beats. Downey Jr. could be Facetiming in his performance at this point, but he continues to surprise with the character both in terms of his delivery on a flippant remark as wells his emotional range. Evans remains the perfect choice for Rogers providing a nice, cool edge to the righteous character. Every member of the cast provides the necessary range and impact to bring their respective character to cinematic life. Stan performs so well here you wouldn't object to seeing him possibly taking over the Cap role from Evans one day. Rudd, Boseman, and Holland all deliver on par to build expectations for their next, solo film in the MCU. In Rudd's case Civil War makes you more excited for Ant-Man and the Wasp than anything found in the actual Ant-Man movie. Holland puts every actor who previously slipped on the Spider-Man tights to shame. It helps that the young actor is actually a teenager, but Holland drops lines of comedic dialogue on par with Downey Jr., and that's saying something. We're already long overdue for Black Widow to get her own, solo movie, but that fact doesn't keep Johansson from continuing her growth as the badass character. That missed beat in the MCU aside, there isn't a forgotten opportunity to be found in Captain America: Civil War. The formula that's been perfected with Marvel's series of movies continues here, their dominance in the world of superhero films only growing stronger with each entry. Civil War not only offers an epic feast of comic book action, it provides something of a turning point to the MCU as a whole as well as an interesting kick-start to Marvel's Phase Three. The interest Civil War builds in what Marvel's future has in store for us is undeniable, and, yet again, the studio has outdone itself. PD...had the same reaction to Spidey. He actually had a role in the movie and wasn't just a cameo shout out for fanboy service. I loved all the surprises in this film. I only watched the original trailer so I was QUITE surprised to see Giant Man! Loved this movie...on par with WS and almost approaches Avengers. Giant Man was an awesome surprise, as I never thought that Marvel would ever explore that side of him with the fact that not everything in the comics makes the big screen cut. Great review, I really enjoyed it. Nice review, I couldn't agree more! 1st act did seem to drag just a little, though every scene did seem vital. Phase Three started with Ant Man. so you're saying antman was phase two?? how do you figure? Can't wait to see Boseman carry his own film, his gravitas and humility makes me want to see the Black Panther movie. And Holland was wonderful as both Peter & Spidey. Can't wait to see this young man's career continue to take off, after his turn in "Into the Sea" then Spider-Man. I love the almost Deadpool-like moment where Spidey tell Captain: "That thing does not obey the laws of physics at all." Great line.